iQRite interactive components are the basis of the intelligence behind the The HoloDesk interactive surface systems that set a new bench mark for international DJ concerts and live performances. When first seen live in concert, the crowd reaction was enthusiastic as Deadmau5 introduced a new way for DJ’s to perform live on the dual imaging touch interactive surface. The following day the viral nature of social media took over as the word spread like wildfire that DJ hardware had taken a major step turning science fiction into commercial reality. The European global debut was in the most royal of cities – London with a king of the dance floor, Deadmau5. The sellout Earls Court concert stunned the crowds when Deadmau5 took to the centre stage to perform Arguru on the 74″ inch HoloDesk interactive touch surface. For creator, inventor and technologist behind the concept, Kevin Andreassend was convinced that the time was ripe to begin the journey of redefining and introducing large format multi touch in live concerts some years before. First seen in the Tom Cruise Minority film, Kevin and his partners at about the same time were planning on how to develop this type of system to the international market. Skip ahead a few years and in the meantime there was a ground swell around the world in finger interaction. Our idea was that we wanted to make a huge transportable in air supported surface, so huge that it would take a van to transport an assembled unit, and so was borne the 74″ dia, 1.7m h x 2m wide HoloDesk. Some other crucial parameters was that it had to be dual imaging and no more than 6mm thick and seem like a floating image. During the year since its debut on the global stage, it was still the biggest secret in New Zealand. Kevin explains, “we wanted to to continue to develop the HoloDesk concept, and control the time launch in our home market. The international opportunities were far greater off shore and so it was natural for us to focus in the European and USA markets. During the beginning of 2011, the New Zealand Government and associated Departments were extensively involved in developing the Innovation Showcase in The Cloud as part of the Rugby World Cup Queens Wharf fan zone. A number of Government officials and industry personnel surveyed NZ industry, as a result HoloDesk was invited to participate in the showcase named “We do things Different”. 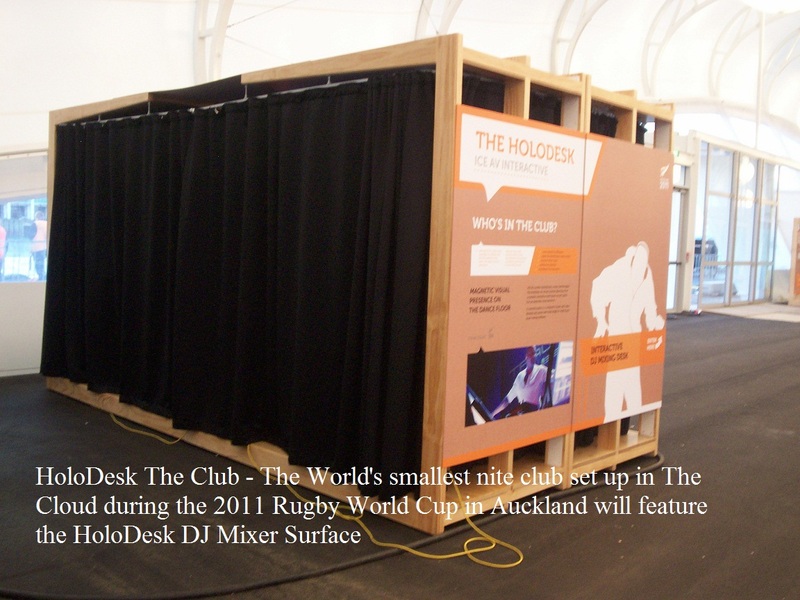 Beginning September The HoloDesk is appearing in a number of events, expos and conferences associated around the Rugby World Cup for the 1,000’s visiting New Zealand. Also timed for the same period, has been the launch of the Holo-Info-Desk with its engaging multi touch software that allows users to access and interactive with a wide selection of media and data sources. Holo-Info-Desk will also ship in a education, retail, meeting room, presentation and expo versions in a range of physical formats. iQRite continues to grow in range and now offering an extensive range of capability based around IR frame offering 1,2,6,10,16,32 touch points providing true multi touch capability. These are supported by the ICE Touch foils (Interactive Communication Emulation) that are now offered in 1 and 2 independent touch points thru timber, glass and ideal for LCD and projection based systems.